Midfielder Cole Skuse says he and his team-mates can see light at the end of the tunnel, despite Saturday’s 2-0 defeat at Nottingham Forest leaving the Blues seven points from safety at the bottom of the Championship. Skuse says the Blues, who are still to taste victory under new manager Paul Lambert with their current winless run now up to seven matches, are able to take more pluses from games now, even those they've lost. 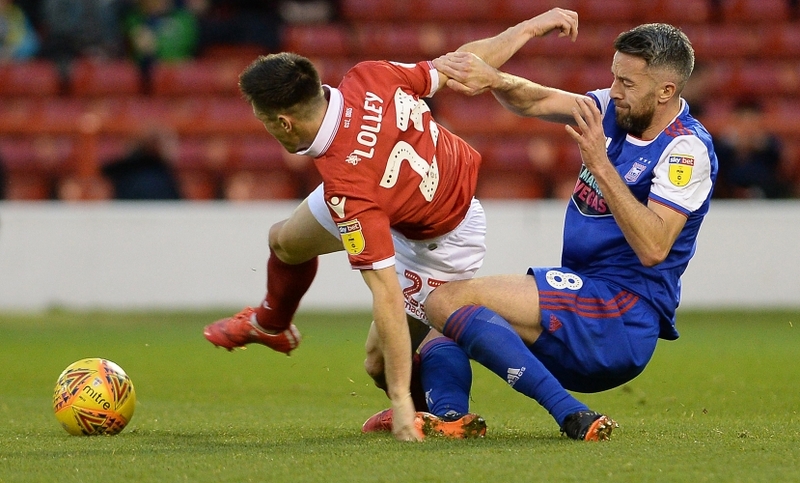 “A defeat’s never easy but we’re far from beating ourselves up,” Skuse said after the game at the City Ground where Town last won back in 1999. “We’re not hiding away from the fact that we’re bottom of the league, we’ve come away to Nottingham Forest and we lost 2-0 but we’re taking loads more positives from losing games and bad situations at the minute. Millwall’s 1-1 draw at Bristol City on Sunday meant the gap to safety remains at seven points, a still very significant and rarely bridged margin from this point in a season. “As I say, we’re not hiding away from the fact that we’re bottom of the league, it’s clear for everyone to see, but there are no panic buttons being pressed, there are plenty of games to play,” Skuse added. “We’re putting in good performances and, I don’t want to sound like a broken record and sound like I’m just trying to smooth it over with you guys [the media], but we genuinely can see the light at the end of the tunnel. Regarding keeper Bartosz Bialkowski, whose error led to Forest’s first goal having made a mistake for Bristol City’s opener in the 3-2 defeat at Portman Road on Wednesday, the 32-year-old said: “Bart’s old enough and he’s definitely ugly enough to dust himself down and pick himself up. “He’s an older man in the changing room and he’s going to make mistakes, he’s made mistakes his career, he’s going to make mistakes in his career like anyone in any walk of life. Skuse echoed manager Lambert’s words insisting that confidence isn’t an issue despite the current situation. “Definitely not, definitely not,” the Bristolian stressed. “And, like I say, this is genuine, I’m not coming out here talking to you guys putting a gloss on it, we’re not in there sat facing the floor, beating ourselves up. Town have kept only one clean sheet this season - in the 0-0 home draw with 10-man Bolton - but Skuse reiterates that the Blues’ fortunes will change now Lambert has taken over. “I don’t want to keep repeating myself but we’re not hanging ourselves up on the fact we’ve not got a clean sheet,” he added. “We know the games are ticking off quick, it’s not going to last forever and we’ve not got forever to turn this situation around and we’re not hiding away from the fact we’re bottom of the league, but we’re not worrying. Skuse agreed the defeat to his old club Bristol City was probably more of a blow to fans than the Forest loss and praised supporters for their commitment and backing home and away, 1,493 having made the trip to the East Midlands. “Wednesday was disappointing because we were at home against a team that were on a bad run themselves and we’re kicking ourselves a little bit that we should have beaten them, especially having gone 2-1 up,” he admitted. “The goals we conceded were poor. “The fans travelled in their thousands today and they’re fantastic at home. I feel as if they’re onside, everyone’s onside, the atmosphere’s been fantastic. “Even walking around the town, walking around the place you can feel a much better atmosphere and I can only thank them for travelling today because, as we know, Ipswich is geographically challenged, it’s not the closest place to everywhere. Asked whether he felt the current situation was difficult for younger players such as Jack Lankester, who made his full debut at Forest, Teddy Bishop, who made his first start since Boxing Day last year, and Flynn Downes, who was among several members of the squad to watch the game from the away end at the City Ground, Skuse said he thought the opposite. “I’d disagree I think,” he reflected. “If you spoke to them and asked them, the morale and the atmosphere amongst everyone is not a bottom of the league team. “You can see that Bish and Jack play with no fear, they did today, they played with a bit of an ease, that bit of spark for us. "Bish showed glimpses of Teddy Bishop when he’s bang at it and I’ve said from day one that he can play at the very top when he’s fully fit. Skuse says he and the other senior pros have a role to play helping the youngsters making their first steps into senior football. “We’ve got quite a young squad, so maybe you do, you find yourself going around, talking to lads more, checking how they are, ‘How’s your day today…’, so you probably do. Skuse paid tribute to skipper Luke Chambers who made his 300th appearance for the Blues at Forest, the club he left prior to joining Town in the summer of 2012. “You know the relationship me and Chambo have got, he’s a very, very close friend of mine,” he said. “He’s not just played 300 games for the club he’s been a massive character for the club on and off the field. New boss Lambert has lavished praise on Skuse since he took charge and the midfielder says he’s enjoying his football working under him. “A lot more,” he admitted. “The gaffer’s come in and he’s been very, very positive with myself from day one. Lambert said last week he wished Skuse was 27 not six years older, something the player himself agrees with. Skuse says his role for Lambert is more like the one he played under Mick McCarthy and at Bristol City. “I’ve never been a player that’s going to go and get 20 goals a season,” he said. “If people think that I should be going and getting 20 goals a season then that’s not going to happen, I’m not that player. “But I played that position a lot for Bristol City and under Mick I played a lot of games there, that is essentially where I prefer to play. “I like to think I read the game quite well and I can get on the ball and give the ball to the likes of Bish and Jack, any of those forward-thinking boys who go and do their bit. That’s what I’d prefer really. “By being that deeper one you can get on the ball and get on the half-turn and play forward more rather than being up the field with your back to their goal. Let's hope your right, I believe better times are ahead for us. It will be interesting to see who lambert brings in with the January transfer window. (Ipswich is geographically challenged, it’s not the closest place to everywhere).,,,,,,he is clearly having a giraffe, as us fans in australia sometimes have to drive 4 hrs or more to the nearest dentist , i recall from a couple of decades ago that ipswich is a town only 40m by regular train from london one of the premier cities in the world...! Very optimistic I would say but the only hope we have is to stay positive so well said even if it is becoming the party line. Yes Cole, the entrance for League One is shining brightly - I can see it too!!! Ha bobble having lived in ipswich I wouldn't call it a premier city but do agree with you that it's not quite as remote as some places down here! sorry to break to you cole, that's a train coming in the opposite direction! Must be a very long tunnel. Breaks my heart to think we’ll be playing away at places like Rochdale next season, not to mention we will probably have to shut an entire stand next season (my moneys on the Sir Alf). If we go down, and lambert stays, then that may be the light Cole is talking about. But if he doesn’t, I fear for this club. Being positive is the only way forward, but personally now i am struggling to think of any other outcome the league 1 next season, will we lose Lambert, what players will we lose and the budget will be adjusted for league 1 too. Although the performances are better and the spirit is better, 2 points from 5 games since Lambert came in, sunday morning errors leading to goals which put us in impossible situations, very hard to see a positive! Relegation and promotion for that lot up the road will be excruciating! All the manager and players can do is stay positive, as it is not their fault that the club has not replaced the likes of Berra, Smith, Waghorn, McGoldrick and Murphy. We need a dominant centre back to get clean sheets, but we have not invested in that position and left ourselves relying on loans. As Joe Royle once said, to defend well you need good defenders! Sorry but what a load of rubbish. 20 goals a season - we don't even get one a season from Skuse. Yes this tunnel is 7 million miles long. I fear we may not get another point this season. Worst times at PR ever !!!!!!!!!! Shame our owner doesn't have that respect for the town fans ! Town fans were brilliant at Forest - singing for the whole game . We even managed to shut the Forest fans up because we didn’t stop singing. We need this ethos at PR more and more now. It’s starting to build. But please let’s REALLY make PR a cauldron of noise, it can be done! Positivity - he's talking about London.. It's just the oncoming train. Of course it's a battle , but the 'war ' isn't lost yet ! Struggles and adversity must be met with determined commitment and optimism ! SO everybody , we should be pleased to recognise the quality & characters who are fighting for the cause ! Football thrives on controversy ,but perhaps we supporters can help by recognising the improvements , however small , week on week as individuals and as a team !! I don't see any light at the end of the tunnel defensively...I think Lambert is installing belief or trying to into a very average bunch of players. Yes they can see the light....at the bottom of the tunnel. But a number of issues even with that...will ME invest? Are we going to lose any players come Jan? Time to gel? How many players do we need? (I'd say five....). Come on people, until it is mathematically impossible to get to fourth from bottom there is hope. One win can boost confidence. Cut out the mistakes and who knows. As for Bart, one more basic error and in comes Gerken! At the end of the day Lambert inherited a very inexperienced squad. A couple of additions in the right areas in next month and who knows. I am not a particular fan of Cole's but lets face it, he has been here some time and always puts in a shift. He doesn't seek adulation and is an honest bloke who I am sure will in time go into Management so please don't knock him or anyone else in these troubled times. Also although League 1 looks inevitable at the moment, we must not lose sight of the fact that there is still FIVE MONTHS left of this season, many points to play for and some teams above us will have as a dreadful patch as we have had. Let's get back as many of our loaned out players as possible, move on who we have that aren't up to it and sign a couple of experienced Championship players who aren't getting much game time. Chris Martin, Darryl Murphy and one or two others could well be short term fixes. It could well be a bust January. Come on keep positive, nothing is impossible.